The Acclaim 25-inch white wall cabinet, completely original and part of the Wyndham Collection Designer Series by Christopher Grubb, is a great way to add a little storage space to your bathroom. This ergonomic and elegant wall cabinet is designed to be placed over the toilet or used as extra wall storage just where you need it most. Brushed chrome hardware accents complete the look and complement the entire Acclaim line. Concealed, soft-close hinges ensure doors close quietly every time, while one interior adjustable shelf allows space customization to best suit your storage needs. It comes largely pre-assembled to expedite setup and installation. The Sonoma Collection brings inspired design and intelligent functionality to the modern bathroom. Featuring a classic style, the Sonoma 12-inch x 55-inch Bathroom Storage Wall Cabinet harmonizes with the collection's vanities and matching mirror for a contemporary, coordinated design in your bathroom. The wall-mounted structure saves space and the open cube shelf and two soft-close doors provide surplus storage. The Sonoma Collection brings inspired design and intelligent functionality to the modern bathroom. Featuring soft-close drawers with state-of-the-art Blum hardware, the 31-inch Sonoma vanity respects the serenity of your bathroom oasis. The wall-mounted style saves space and the Glossy White finish pleases the eye. Match the vanity with the handsome coordinating wall cabinet and mirror for a stunning ensemble look. Top not included. With beadboard-style side panels and louvered double doors, this vanity cabinet will give your bathroom the look and feel of a rustic cottage-and if you have such a retreat for this item, even better. The antique white finish on this piece evokes cleanliness and calmness, bringing a sense of tranquility to your home. At 30-inch W, this vanity is an ideal size for most powder rooms and bathrooms. A fully-extending bottom drawer adds to the ample storage space you'll find behind the two cabinet doors above. Explore the Foremost Cottage collection for wall/floor/medicine cabinets and wall mirrors in the same style. Reflecting the subtle style of the Naples collection by Foremost, this fully assembled Wall Cabinet in Warm Cinnamon boasts a wealth of storage possibilities. Behind its two craftsman-style doors are two adjustable shelves for complete space customization, while a pull-down lower drawer offers a place to stash frequently used items. Big on style and storage, the cabinet offers a perfect solution for organizing washcloths, toiletries, bathroom accessories and more, keeping your space clean and clutter-free. 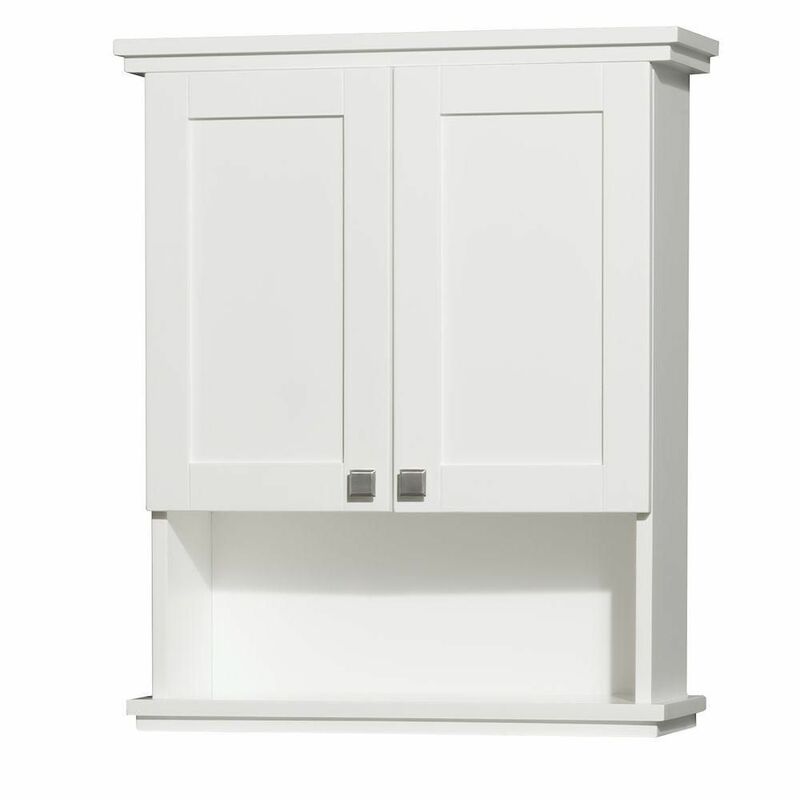 Acclaim 25-inch W x 30-inch H x 9-1/8-inch D Bathroom Storage Wall Cabinet in White The Acclaim 25-inch white wall cabinet, completely original and part of the Wyndham Collection Designer Series by Christopher Grubb, is a great way to add a little storage space to your bathroom. This ergonomic and elegant wall cabinet is designed to be placed over the toilet or used as extra wall storage just where you need it most. Brushed chrome hardware accents complete the look and complement the entire Acclaim line. Concealed, soft-close hinges ensure doors close quietly every time, while one interior adjustable shelf allows space customization to best suit your storage needs. It comes largely pre-assembled to expedite setup and installation. Acclaim 25-inch W x 30-inch H x 9-1/8-inch D Bathroom Storage Wall Cabinet in White is rated 3.8 out of 5 by 13. Rated 5 out of 5 by Mike from The mounting-bar method is a real plus—even though my wife... The mounting-bar method is a real plus—even though my wife pointed out that I got it a degree or so out of true. The cabinetry is of top quality. Rated 5 out of 5 by mikie from cabinet was received at the store really early, that's good! finish looks good, materials seem so... cabinet was received at the store really early, that's good! finish looks good, materials seem solid. only received two of the three mounting screws needed. a little disappointed there was no bottom back rail where the back should be attached. the back is attached with only 2 small screws and no glue to the side panels. the back's structural usefulness is minimal at best. in my case this was important since i could only attach mounting bracket to one wall stud. had to add a bottom back rail screwed to the lower shelf on the backside. once the cabinet was up (a breeze), just ran a screw through the back/new rail into the stud. it would be nice to have the inside shelf adjustable, this one only has one set of holes for the inner shelf holder pegs, (it's an easy fix if the "Boss" wants it). over-all, i'm satisfied and never sure about the "ultimate customer". Rated 5 out of 5 by Danny from Great quality . Looks great!... Great quality . Looks great! Rated 5 out of 5 by JJ from Packaging was good. It was easy to install. Soft close... Packaging was good. It was easy to install. Soft close is a great feature. Rated 5 out of 5 by happypappy from Was a little skeptical based on some previous reviews, but... Was a little skeptical based on some previous reviews, but the cabinet arrived undamaged and looks great. Easy to install. Rated 1 out of 5 by HomeDepotCustomer from No final inspection evidently was done on this cabinet before... No final inspection evidently was done on this cabinet before packing. It was poorly assembled . Two screws were not properly placed and came through the bottom back of the cabinet instead of securing the shelf they just came through the back. Rated 5 out of 5 by CentreBear from A stylish addition of space and storage in the bathroom.... A stylish addition of space and storage in the bathroom. Very attractive and functional. Rated 5 out of 5 by cabinet from This is a very nice product. Modern design and a nice look! We purchased it for use in our chur... This is a very nice product. Modern design and a nice look! We purchased it for use in our church basement ladies restroom.